How do Antioxidants Work Anyway? So you know that they're good for you, but how do antioxidants work to make you healthier? Remember the spark analogy? Think of free radicals like sparks from a fireplace and your body is the carpet around it. When a spark flies out of your fireplace and lands on your carpet, it leaves a little hole where it landed. After a few years, your carpet is going to be looking pretty ratty, right? Well, antioxidants are like the screen on the fireplace- they stop the free radical before it can cause any damage. But how do antioxidants work? It's difficult to explain without getting a little bit technical, so beware: the following is more scientific than some of you may like. Technically, antioxidants scavenge the unpaired electron from the free radical , making it harmless. This happens through a chemical reaction- or a series of them. Most of these reactions need something called an enzyme to make them work. And many of these enzymes are actually antioxidants themselves- your body even makes them- that's how important antioxidants are! Many minerals are vital parts of these reactions too, even though they're not antioxidants themselves (so they're equally important to have). These include selenium, manganese, copper and zinc. The chemical reaction is kind of a sacrifice for the antioxidant because the process of inactivating the free radical changes the antioxidant itself. Some are changed to entirely different compounds, some get excreted by the body and some are actually regenerated by another antioxidant (then they can be used again!). That brings me to an important point of how antioxidants work: SYNERGY!!! Synergy just means that the effect of a few things working together is greater than the sum of its parts. In other words, when you're talking about how antioxidants work, 3+3 equals 10, not 6. Antioxidants work best as a team. When you're playing football, you won't be very effective with just the quarterback and receiver. You need everyone else to support them. It's the same with antioxidants. That's where the problem with many scientific studies come in. Scientists give people these large doses of just 1 antioxidant and then are disappointed with the results they get. Some studies have even showed that the condition being studied got worse (eg. Vitamin E and heart disease or Beta-carotene and smokers). You can't fault the scientists because that's usually good scientific practice- only change 1 thing at a time so that you know what is having the effect. Unfortunately, antioxidants are not like drugs that are meant to be used by themselves. It's only been recently that studies are being done with several antioxidants (and still most of them are only 2 or 3). What I've discovered is that the more antioxidants being used in the studies, the more dramatic the results. Vitamin E is the main antioxidant in the cell membrane. Vitamin C and glutathione work mostly in the inner fluid of the cell. Vitamin C, E and selenium enhance the effects of beta-carotene- also a potent antioxidant. Coenzyme Q10 works in the mitochondria to help make energy and it also regenerates Vitamin E. These 2 antioxidants also protect the mitochondria from the massive amounts of free radicals that are made when you produce energy. 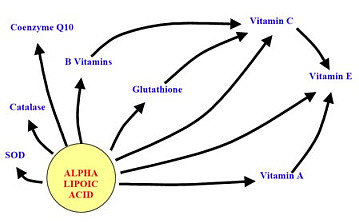 Alpha lipoic acid and the proanthocyanidins (found in grape seed and pine bark extracts) regenerate Vitamin C, which in turn, regenerates Vitamin E.
So the answer to "How do antioxidants work?" is not simple.